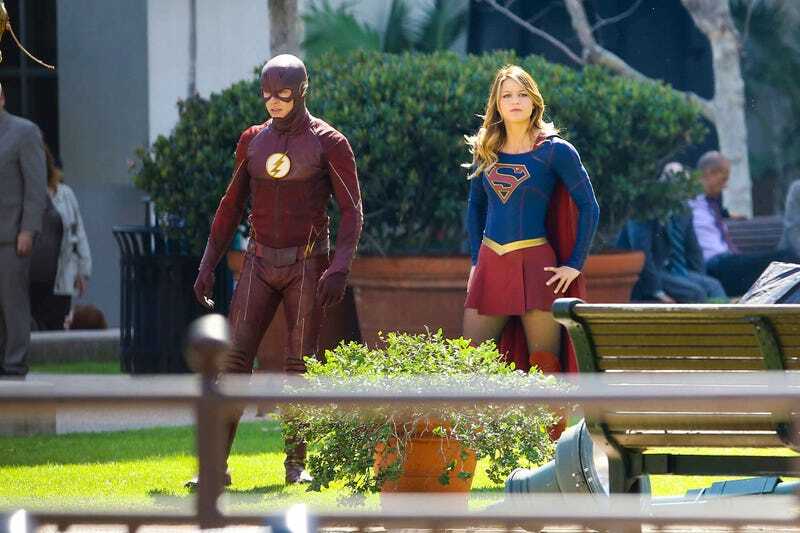 Some have pointed out that The Flash’s suit looks really dark next to Supergirl, and I agree. I think Cisco (and the Flash costume people) need to further upgrade the suit to at least make it the same shade of red as Supergirl’s cape. Recently, there’s been two very good reasons for this change (besides the fact that in the comics his suit it bright red and not burgundy) and both of them come from Marvel. I can see that dark red really working for DD’s gritty street level heroing, but Barry, like Kara, is all about hope and inspiration. They have action figures and lattes of the Flash, they have day-long celebrations in his honor. The Flash and DD shouldn’t be confused with each other in a dark alley and right now their costumes are very similar. The Flash needs to embrace the light side of the Speed Force. This costume has made it okay to go bright for live action superheros. It doesn’t look silly at all. It looks, quite frankly, amazing. The Flash started as DC TV’s version of Sam Rami’s Spider-Man. I loved that about it. It worked so well for the character and the story, but now Spider-Man has evolved into a more true version of himself (at least visually) and I believe The Flash should follow. We know he will eventually move into his more traditional comic book look and season 2 gave us the white emblem. I feel that season 3 should give us a more vivid shade of red, maybe as a rejection of Zoom’s darkness or maybe because Cisco got bored over the summer...but we need to see the Scarlet Speedster the way he was meant to be. Thoughts? Do you all like the suit the way it is? Is it too soon to change?